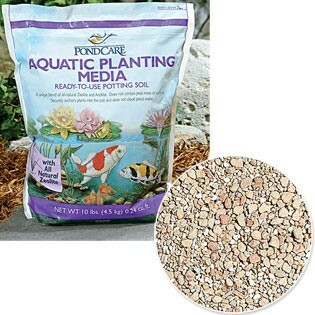 Aquatic Planting Media is a ready-to-use potting soil comprised of a unique blend of natural minerals including zeolite, which provides a clean, easy-to-use planting media for water gardeners. Aquatic Planting Media securely holds the plants in the pot and won't cloud the water or clog pumps and filters. Will not float or cloud the pond water when plants are moved, fertilized, or disturbed by fish. Will not clog filters and pumps, change pH, or discolor the pond water.